Finally I've seen this film. It's only been in cinemas two months and comes out on DVD in April, but this time of year is such a hard time to see everything you want! 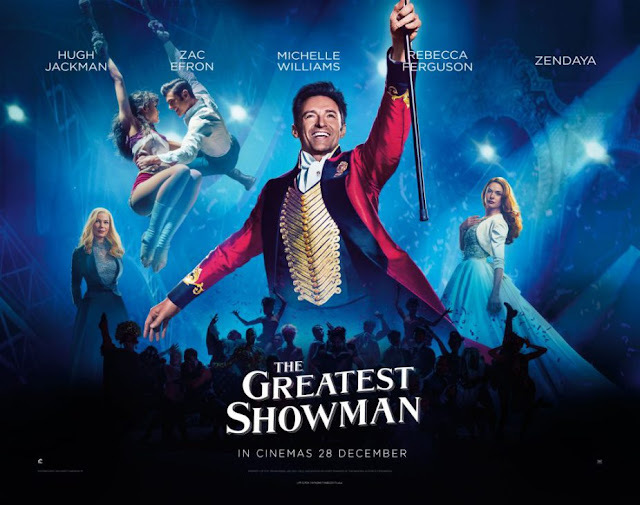 The Greatest Showman is a musical starring Hugh Jackman as P.T Barnum, and tells the story of how he came from nothing and grew to become a worldwide sensation for his acts and shows but couldn't seem to stop wanting more. I thought this film was really good to see as a family. It's getting quite mixed reviews because actual critics are giving it worse reviews than it deserves, however the audience love it. I overheard people in the show we went to see saying this was the 3rd time they've seen it and I do see why, the songs are catchy, the movie is upbeat and it does put you in a good mood after seeing it. The songs are really good when it's the bigger performances. I love the style of the songs and the dancing, even though it's not at all in the style of the era it does feel right for the movie and shows how modern P.T Barnum was. When they go big, they go really big and it does mean a couple of the other smaller songs are forgotten which is a shame. The cast were really great. Hugh Jackman is fantastic and shows a lot of passion for the role, apparently it was a story he wanted to make for a number of years now and it does show in his acting. Zac Efron is fantastic as always and the chemistry with Zendaya was really good. I would recommend this movie, especially in cinemas because the big acts and music sound and look fantastic on a big screen. I think it's a really good uplifting film. Have you seen The Greatest Showman? What did you think?